Tammey Stubbs, proprietor of Stubbs Estates, returned to her Midwest roots in 2010 - coming back to Wichita KS from her nearly 30-year career in New York City as owner & president of Art at Large Inc. - a Retail Design firm and Fine Arts gallery. Stubbs, an avid collector of antiques. fine art and folk art, has now brought her marketing prowess to meld with her passion for estate appraisals and sales. With a Master's Degree in Communication Design from Pratt Institute in NYC - add "Certified Appraiser" and member of the Certified Appraiser's Guild to her list of expertise and passions and you have a pretty dynamic force for success. Estates sales is her passion. We serve the Wichita KS and surrounding areas for estate sales, but welcome consignment and appraisal opportunities throughout the USA. STUBBS ESTATES - Beautiful Epic Hoard. What could be better?! Stubbs Estates presents two prominent families, one incredible sale. Last blast! Stubbs Estates 75% OFF Bel Aire estate. One day only! 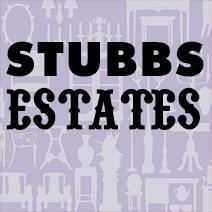 Stubbs Estates - 4-Generations / 4-Day Sale. Biggest ever. Stubbs Estates presents another luxe sale: designer furniture and finery at estate sale prices!